If you’re based in Radlett, Hertfordshire, then we can provide the answers you need to a wide range of grounds maintenance issues. From lawn care and turfing through to pathway maintenance, our skilled team will willingly undertake the work your outdoor space needs to keep it in pristine condition. Considering that the approach to your home or office is the first thing which visitors see, effective commercial landscaping and premium grounds maintenance is essential to create that favourable first impression. We work extensively with schools and care homes in and around Radlett, Hertfordshire, as well as in surrounding towns including Aldenham and Borehamwood. In addition to generic garden maintenance for these types of establishment we can also offer specialist services such as playground marking. If you’re not sure what type of maintenance you need, we’re happy to provide a recommended schedule based on what works for other establishments of a similar nature that we work with. All our grounds maintenance workers are appropriately qualified and experienced in the tasks they need to undertake and work in a safe, professional way. 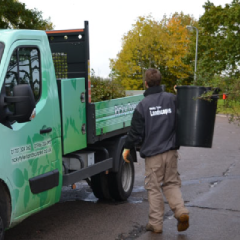 Recognising that whilst on site our workers are highly visible to your clients, staff and visitors, we ensure they always behave in a suitable manner and carry out rigorous monitoring and surprise site visits in order to ensure that the professional landscaping service you receive is always exemplary. Many companies and local property owners in Radlett, Hertfordshire contract with us on an on-going basis to keep their exteriors looking good. As well as regular tasks we also undertake weather dependent matters such as gritting in a prompt, responsive manner. Alternatively, we are able to undertake one-off commercial landscaping projects which can transform a piece of redundant ground in Shenley or Watford into a spectacular, green vista which is always appealing. Ricky Tyler Landscapes can provide gardening and grounds maintenance services including Radlett Grounds Maintenance covering Radlett, Hertfordshire .